Born in England in 1875, Dorothea Forster Baird made her first stage appearance with the Oxford Union Dramatic Society (OUDS) in 1894 as Iris in A Midsummer Night’s Dream. 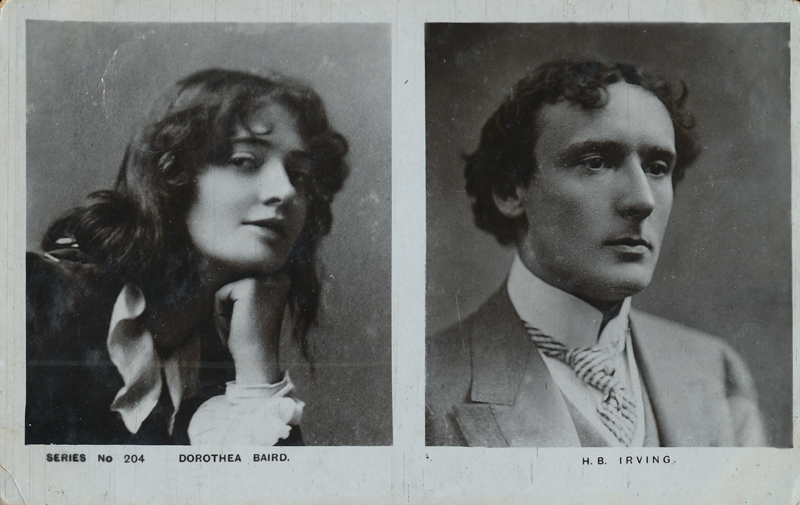 She then married friend and former OUDS player Henry B. Irving, the son of Sir Henry, in 1896, so her career was quite naturally entwined with that of her husband. They seldom appeared separately on stage. In 1894, Baird joined Ben Greet’s company where she played many Shakespeare roles, among them Hippolyta and Helena in A Midsummer Night’s Dream, Hermione in The Winter’s Tale, and Rosalind in As You Like It. Her first appearance on the London stage was as Hippolyta. She got her big break when Beerbohm Tree chose Baird to play Trilby opposite his Svengali in his 1895 production of Trilby at the Haymarket Theatre. This play, and Baird’s portrayal, made it fashionable for women to smoke cigarettes in private and was the source of the Trilby hat for men. In 1904, Baird created the role of Mrs. Darling in the first-ever production of J. M. Barrie’s Peter Pan after being considered for the role of what became Captain Hook. H. B. Irving began to revive many of his father’s plays and most famous parts, so Baird had an opportunity to play in The Bells, The Lyons Mail, and numerous Shakespeare plays. Between 1895 and 1913 she played the major female roles in As You Like It, The Merchant of Venice, A Midsummer Night’s Dream and Hamlet. Both Baird and H. B. Irving had long successful careers and Shakespeare was no small part of their repertory. Her last role in London was as Portia in a 1910 run of The Merchant of Venice at His Majesty’s Theatre. In 1913, Baird retired from the stage and spent most of her time in charitable causes, primarily those that benefited infant welfare. She died in Kent in 1933 regarded as an outstanding performer, even more so than her husband who was never quite able to step from beneath the shadow of his legendary father.